Abstract. Tidal marshes are sedimentary environments and are among the most productive ecosystems on Earth. As a consequence they have the potential to reduce atmospheric greenhouse gas concentrations by sequestering organic carbon (OC). 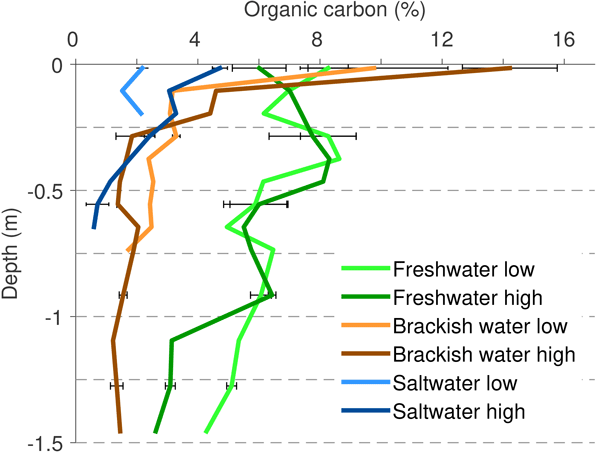 In the past decades, most research on soil organic carbon (SOC) storage in marsh environments has focused on salt marshes, leaving carbon dynamics in brackish and freshwater marshes largely understudied and neglecting the diversity among tidal marshes. We therefore conducted an extensive sampling campaign to quantify and characterize SOC stock in marshes along a salinity gradient in the Scheldt estuary (Belgium and the Netherlands). We find that SOC stocks vary significantly along the estuary, from 46 in freshwater marshes to 10kgOCm−2 in salt marshes. Our data also show that most existing studies underestimate total SOC stocks due to shallow soil sampling, which also influences reported patterns in OC storage along estuaries. In all sampled tidal marsh sediments the SOC concentration is more or less constant from a certain depth downward. However, this concentration decreases with increasing salinity, indicating that the amount of stable SOC decreases from the upper estuary towards the coast. Although the net primary production of macrophytes differs along the estuary, our data suggest that the differences in OC storage are caused mainly by variations in suspended sediment concentration and stable particulate OC (POC) content in the water along the estuary. The fraction of terrestrial suspended sediments and POC that is transported downstream of the maximum turbidity zone is very limited, contributing to smaller amounts of long-term OC sequestration in brackish and salt marsh sediments. In addition, high rates of sediment deposition on freshwater tidal marshes in the maximum turbidity zone promote efficient burial of OC in these marsh sediments. How to cite: Van de Broek, M., Temmerman, S., Merckx, R., and Govers, G.: Controls on soil organic carbon stocks in tidal marshes along an estuarine salinity gradient, Biogeosciences, 13, 6611-6624, https://doi.org/10.5194/bg-13-6611-2016, 2016. 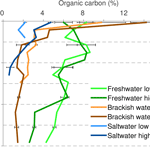 The results of this study on the organic carbon (OC) stocks of tidal marshes show that variations in OC stocks along estuaries are important and should be taken into account to make accurate estimates of the total amount of OC stored in these ecosystems. Moreover, our results clearly show that most studies underestimate the variation in OC stocks along estuaries due to a shallow sampling depth, neglecting the variation in OC decomposition after burial along estuaries.